Mummy, what did you do in the Great War? The Forum, Norwich recently contacted us to see if we could help them with their next First World War project. The Forum, Norwich, is appealing for people to share their stories and memories of Norfolk women in the First World War who were either on active service or remaining strong on the Norfolk home-front. Thousands of Norfolk women had their lives completely transformed during the First World War. They proved their strength and bravery was essential to the war effort and beyond and here at The Forum we’re keen to hear from local people who may have stories, photographs, letters and objects to share. This may include: farm workers, Women’s Army Auxiliary Corps, Women’s Royal Naval Service, Women’s Royal Air Force, Munitions, British Red Cross Society, Women’s Land Army, women in the factories and shops, transport, canteens, hospitals, comforts and the post office. If you have any information about Norfolk women involved in the First World War please get in touch with The Forum’s Heritage Assistant, Lizzie Figura-Drane via email: heritage.assistant@theforumnorwich.co.uk or telephone: 01603 727971. 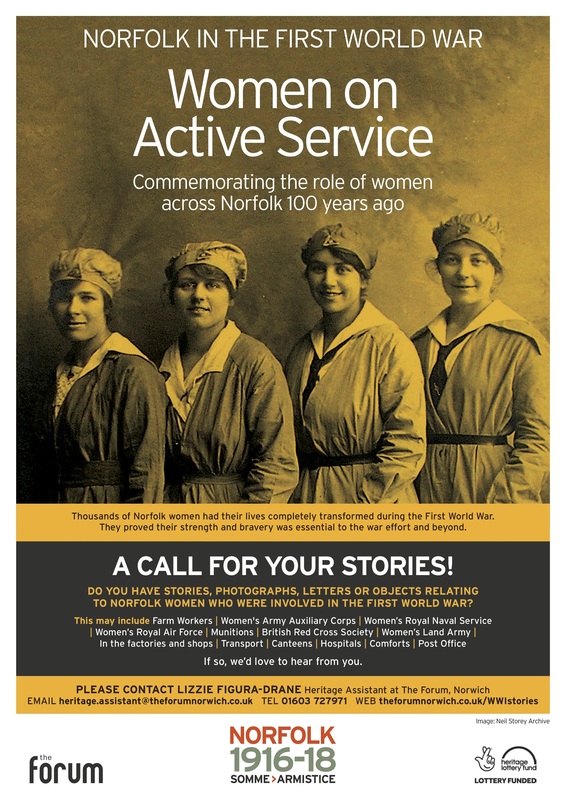 The Forum is currently working with a team of volunteers to research the role of Norfolk women on active service and any stories shared with The Forum will be added to this research. All of the learning from the project will culminate in a Women on Active Service exhibition starting at The Forum and the Norfolk and Norwich Millennium Library on 04 November 2017. Following this, the exhibition and accompanying films will go on tour to schools and community venues around Norfolk. This entry was posted in Information needed, Local collections, research project and tagged Norfolk, women, women at war. Bookmark the permalink. ← The Mystery of a Military Cross Award.